Is this you? Is this them? 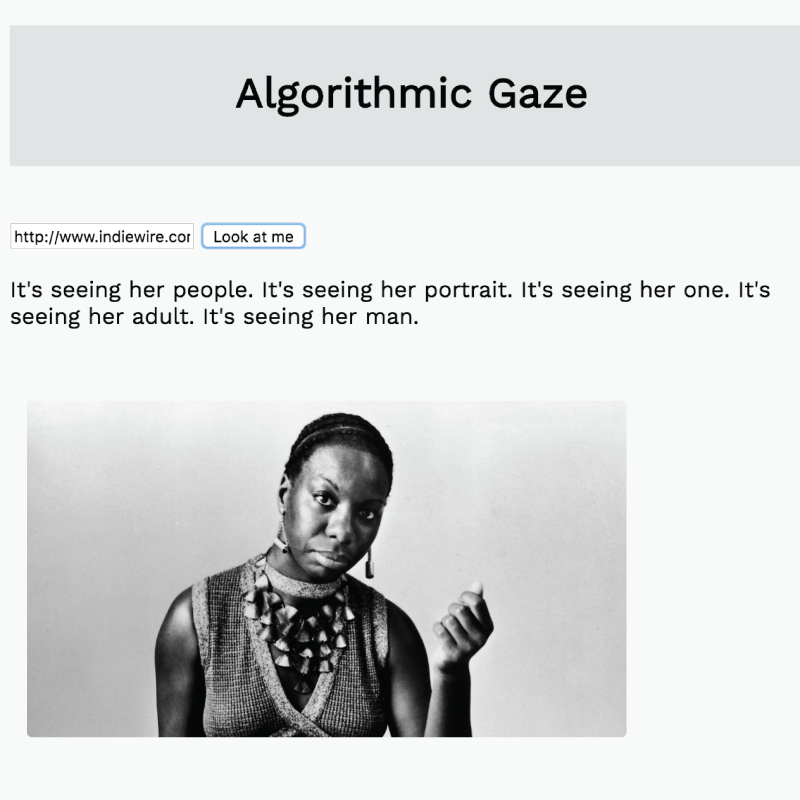 The algorithmic gaze, again. 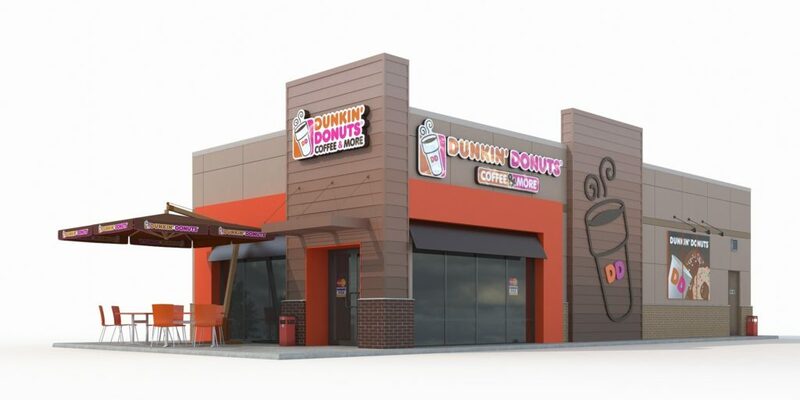 Last week I presented a handful of different design concepts for my project. 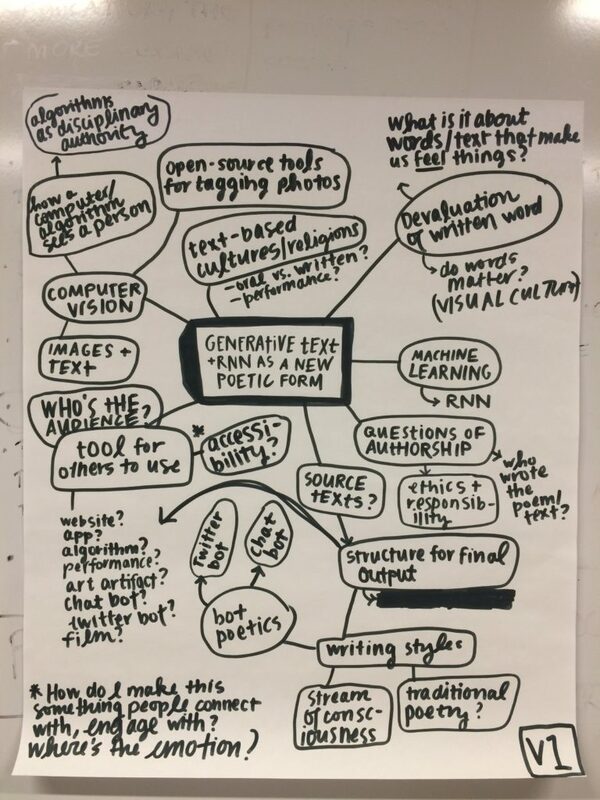 The feedback from my classmates was actually very positive – while I feel that the project still lacks focus at this stage, their comments reaffirmed that the different iterations of this projects are all connected by a conceptual thread. My task in the coming weeks is to continue following that thread and consider each iteration of the project a creative intervention into the same set of questions. We know that systems that are trained on datasets that contain biases may exhibit those biases when they’re used, thus digitizing cultural prejudices like institutional racism and classism. Researchers working in the field of computer vision operate in a liminal space, one in which the consequences of their work remain undefined by public policy. 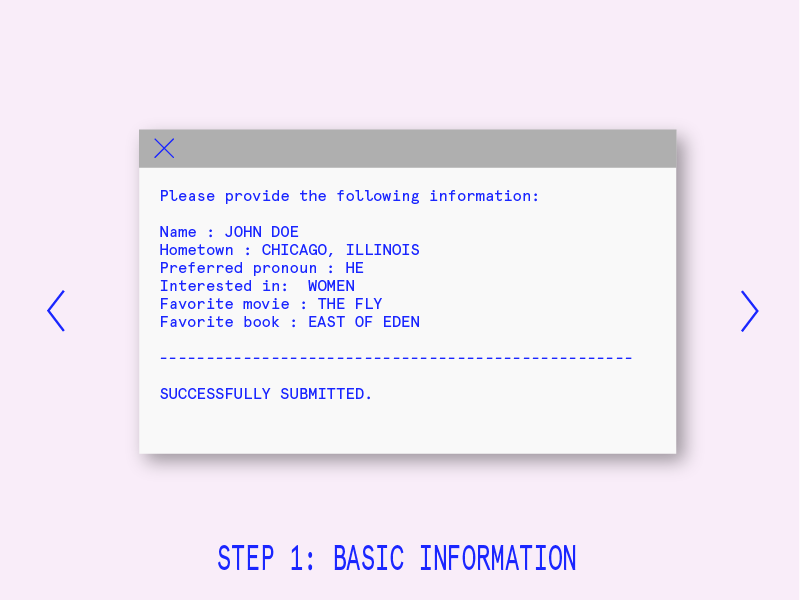 Very little work has been done on “computer vision as a critical technical practice that entangles aesthetics with politics and big data with bodies,” argues Jentery Sayers. I want to explore the ways in which algorithmic authority exercises disciplinary power on the bodies it “sees” vis-a-vis computer vision. 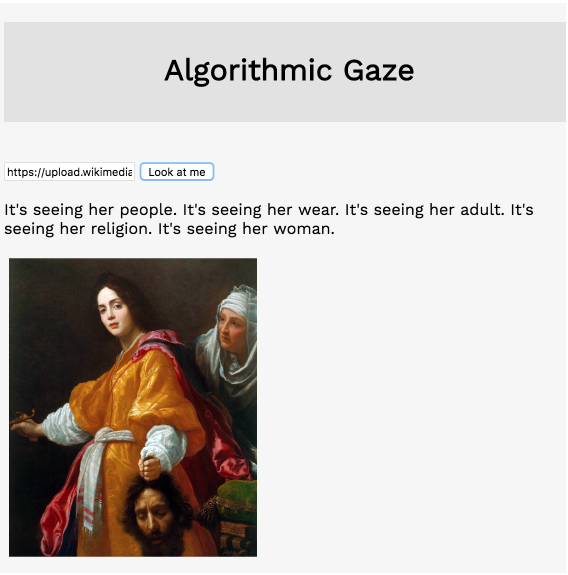 Last week I wrote about Lacan’s concept of the gaze, a scenario in which the subject of a viewer’s gaze internalizes his or her own subjectivization. Michel Foucault wrote in Discipline and Punish about how the gaze is employed in systems of power. 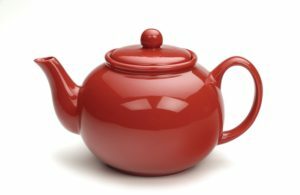 I’ve written extensively about biopower and surveillance in previous blog posts (here and here), but I want to continue exploring how people regulate their behavior when they know a computer is watching. Whether real or not, the computer’s gaze has a self-regulating effect on the person who knows they are being looked at. Computer vision is generally associated with the programmatic description and reconstruction of the physical world in digital form (Szeliski 2010: 3-10). 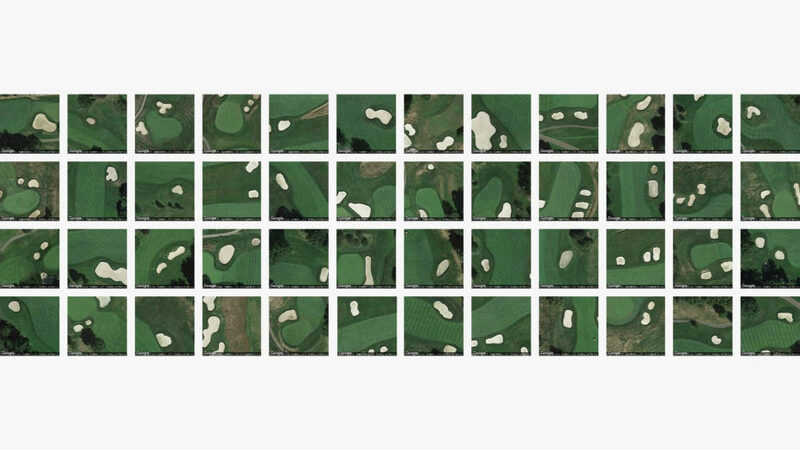 It helps people construct and express visual patterns in data, such as patterns in image, video, and text repositories. The processes involved in this recognition are incredibly tedious, hence tendencies to automate them with algorithms. They are also increasingly common in everyday life, expanding the role of algorithms in the reproduction of culture. From the perspective of economic sociology, A. Aneesh links such expansion to “a new kind of power” and governance, which he refers to as “algocracy—rule of the algorithm, or rule of the code” (Aneesh 2006: 5). 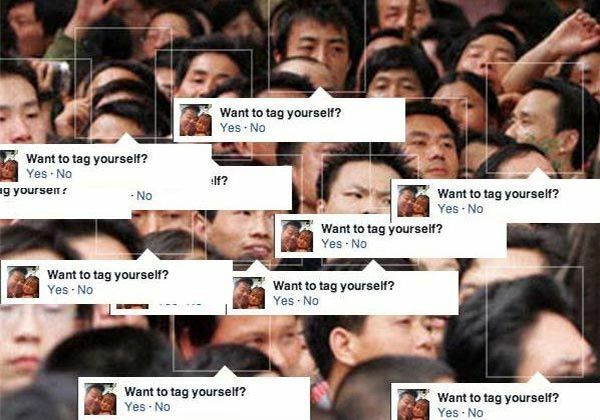 Here, the programmatic treatment of the physical world in digital form is so significantly embedded in infrastructures that algorithms tacitly shape behaviors and prosaically assert authority in tandem with existing bureaucracies. 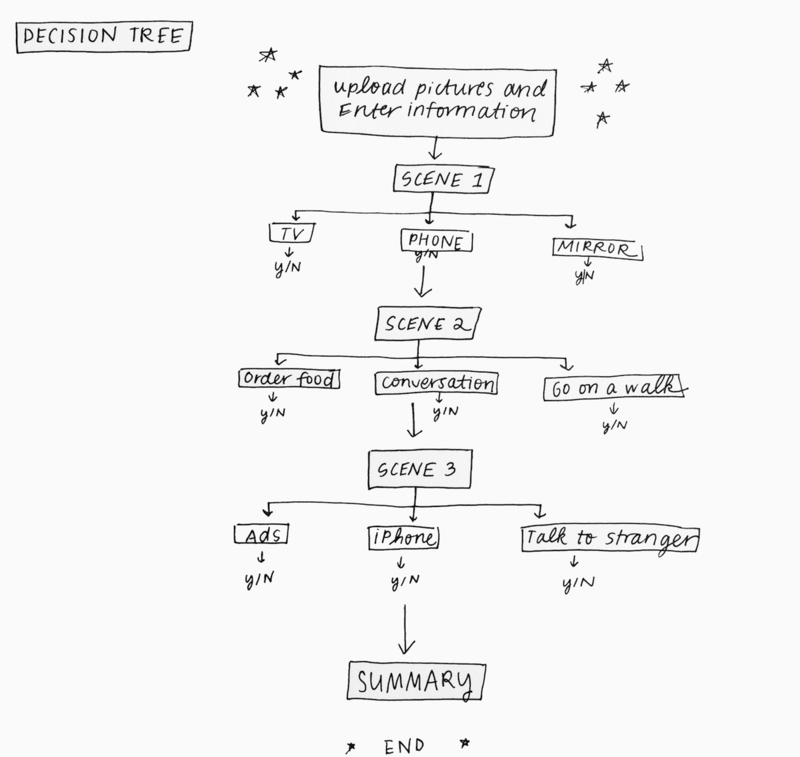 Routine decisions are delegated (knowingly or not) to computational procedures that—echoing the work of Alexander Galloway (2001), Wendy Chun (2011), and many others in media studies—run in the background as protocols or default settings. For the purposes of this MLA panel, I am specifically interested in how humanities researchers may not only interpret computer vision as a public act but also intervene in it through a sort of “critical technical practice” (Agre 1997: 155) advocated by digital humanities scholars such as Tara McPherson (2012) and Alan Liu (2012). I love these questions posed tacitly by pioneering CV researchers in the 1970s: How does computer vision differ from human vision? To what degree should computer vision be modeled on human phenomenology, and to what effects? Can computer or human vision even be modeled? That is, can either even be generalized? Where and when do issues of processing and memory matter most for recognition and description? And how should computer vision handle ambiguity? Now, the CV questions posed by Facebook and Apple are more along these lines: Is this you? Is this them? 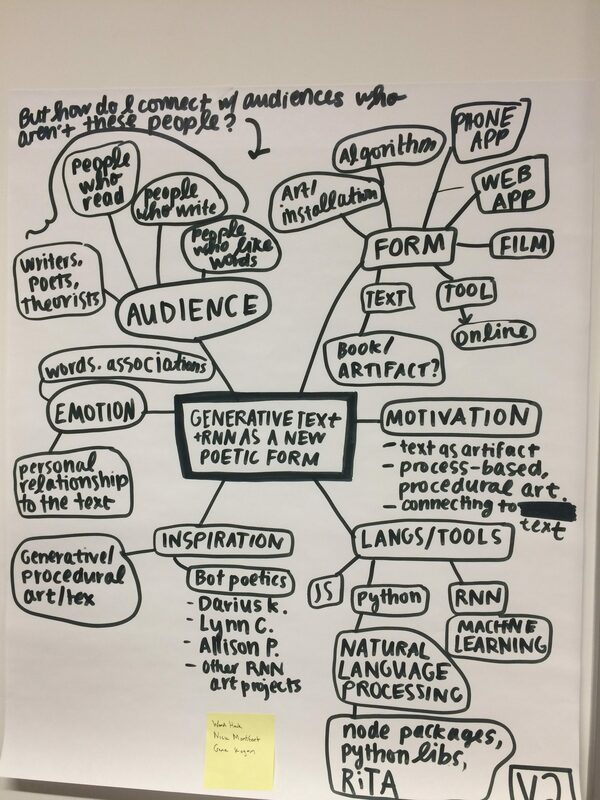 So how will these new ideas help me shape my project? For one, I’ve become much more wary of using pre-trained data sets like the Clarifai API or Microsoft’s COCO for image recognition. This week I built a Twitter bot that uses the Clarifai API to generate pithy descriptions of images tweeted at it. I honestly was disappointed by the lack of specificity the data set offered. However, I’m excited that Clarifai announced today a new tool for users to train their own models for image classification. I want to probe the boundaries of these pre-trained data sets – where do these tools break and why? How can I distort images in a way that objects are recognized as something other than themselves? 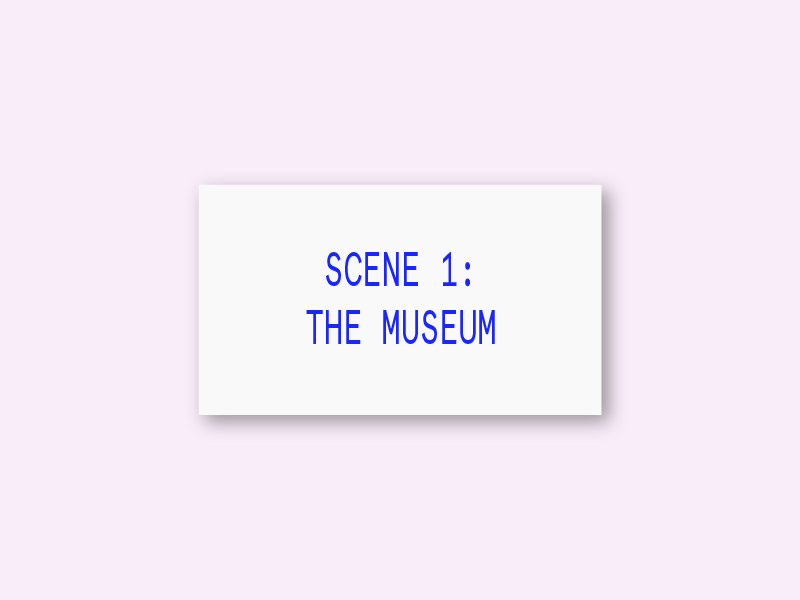 What would happen if I trained my own data set on a gallery of images that I have curated? Computer vision isn’t source code; it’s a system of power. 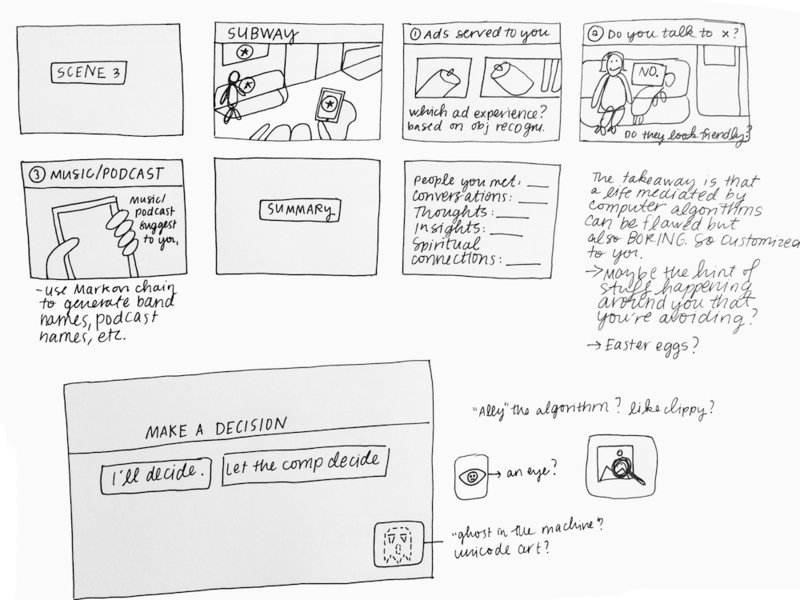 For my project, I want to have control over the content that the model is being trained on so that it outputs interesting or surprising results. In terms of the aesthetic, I want to try out different visual ways of organizing these images – clusters, tile patterns, etc. Since training one of these models can take as little as a month, the goal for this week is to start creating the data set and the model. I’ve been reading Wendy Chun’s Programmed Visions and Alexander Galloway’s Protocol: How Control Exists After Decentralization for months, but I’m recommitting to finishing these books in order to develop my project’s concept more fully. 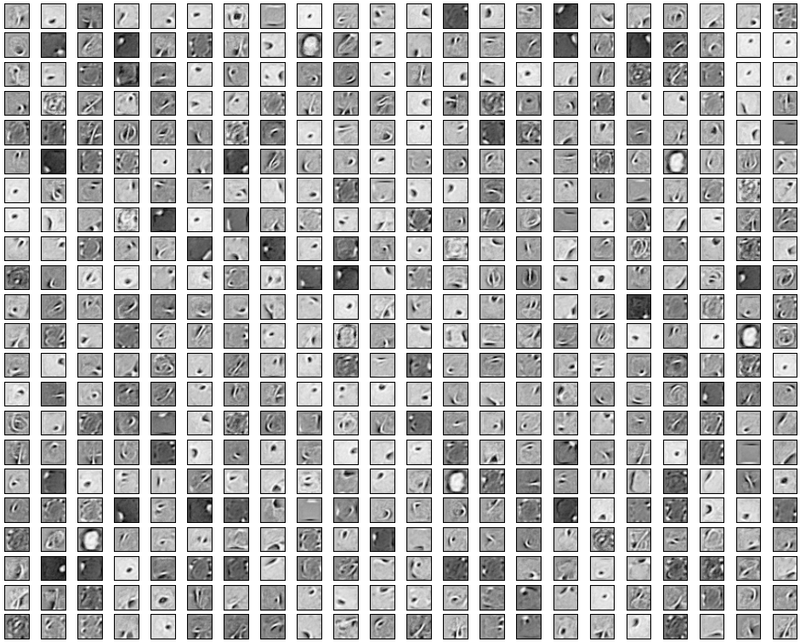 As mentioned last week, I’m exploring the idea of the algorithmic gaze vis-a-vis computer vision and machine learning tools. Specifically, I’m interested in how such algorithms describe and categorize images of people. 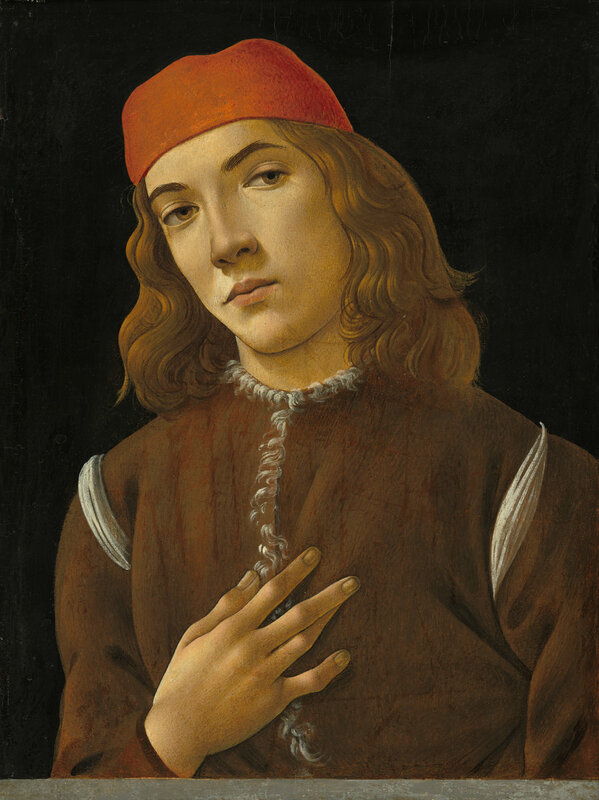 I’d like to focus primarily as the human body as subject, starting with the traditional form of the portrait. 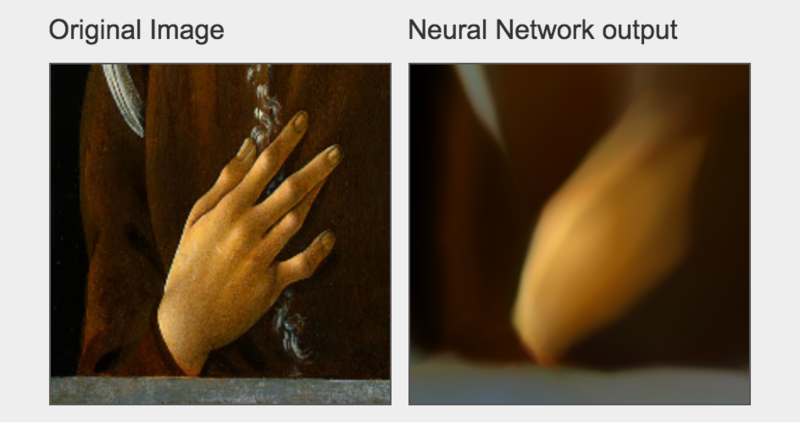 What does a computer vision algorithm see what it looks at a human body? How does it categorize and identify parts of the body? When does the algorithm break? 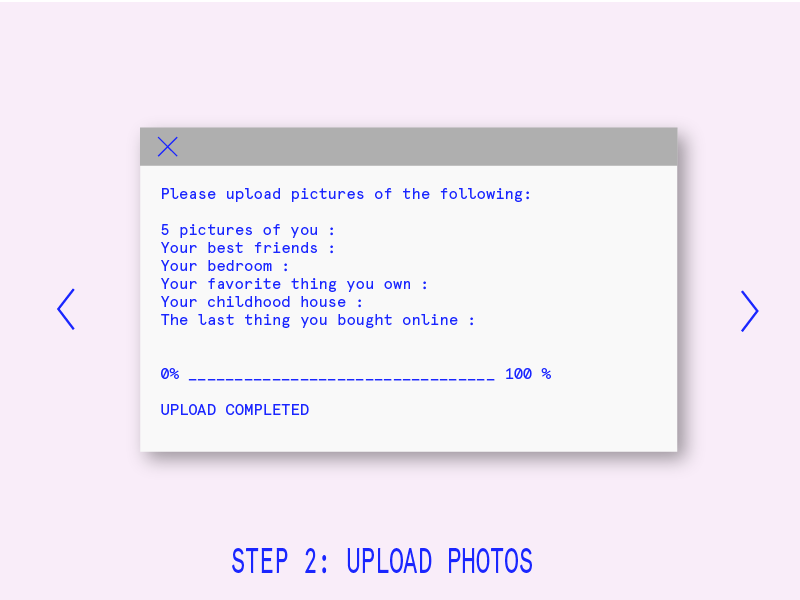 How are human assumptions baked into the way the computer sees us? 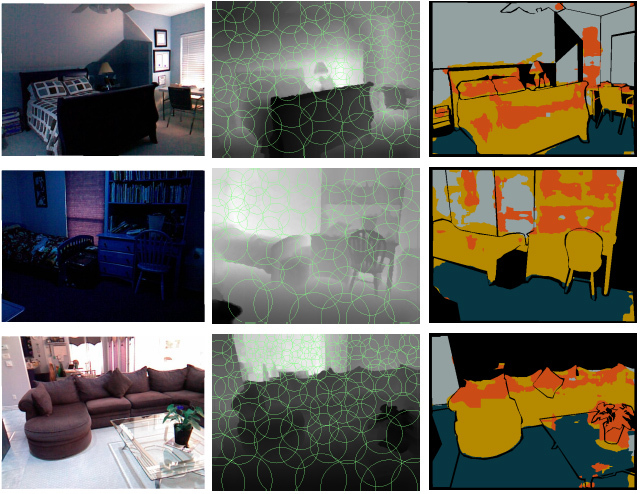 The following ideas are variations on this theme, exploring the different capabilities of computer vision. 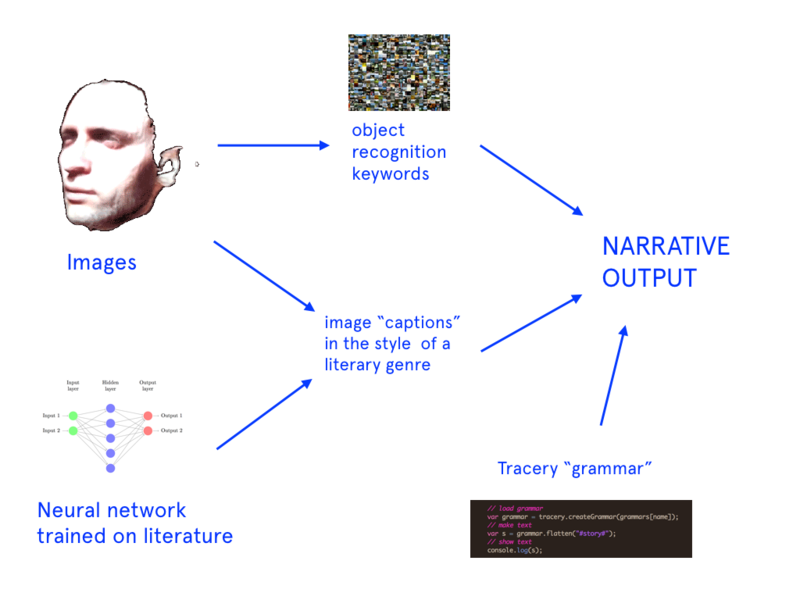 Project idea #1: Generative text based on image INPUT. In the example below, I’ve taken the array of keywords generated by the Clarifai API and arranged them into sentences to give the description some rhythm. I used Clarifai’s image captioning endpoint in order to generate an array of keywords based on the images it’s seeing and then included the top 5 keywords in a simple description. You can find my repo code over here on Github. PROJECT IDEA #2: IMAGE PAIRINGS OR CLUSTERS. 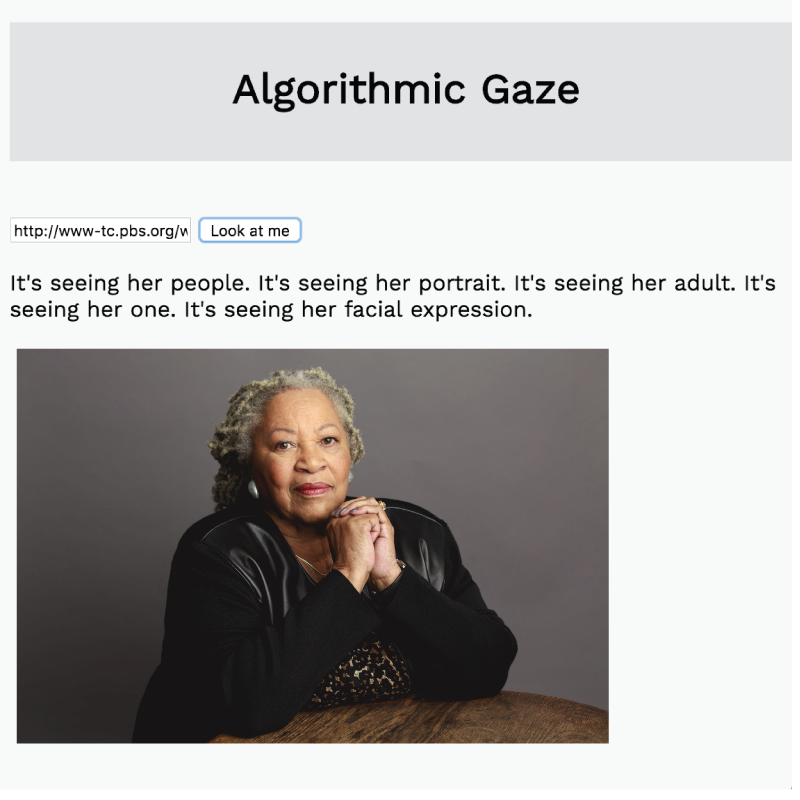 In the first project idea, I’m exploring which words an algorithm might use to describe a photo of a person. With this next idea, I’d be seeking to understand how a computer algorithm might categorize those images based on similarity. The user would input/access a large body of images and then the program would generate a cluster of related images or image pairs. 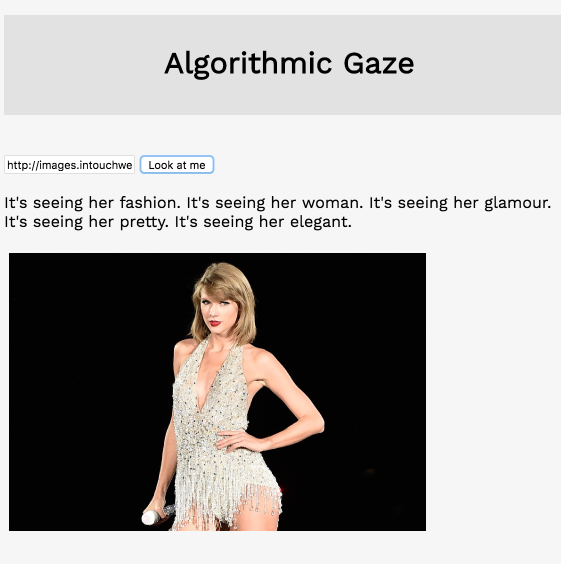 Ideally the algorithm would take into account object recognition, facial recognition, composition, and context. The result is a stunning side-by-side comparison of two images you might never have paired together. It’s the result of what happens when a neural net curates an art exhibition – not terribly far off from what a human curator might do. I’d love to riff on this idea, perhaps using the NYPL’s photo archive of portraits. 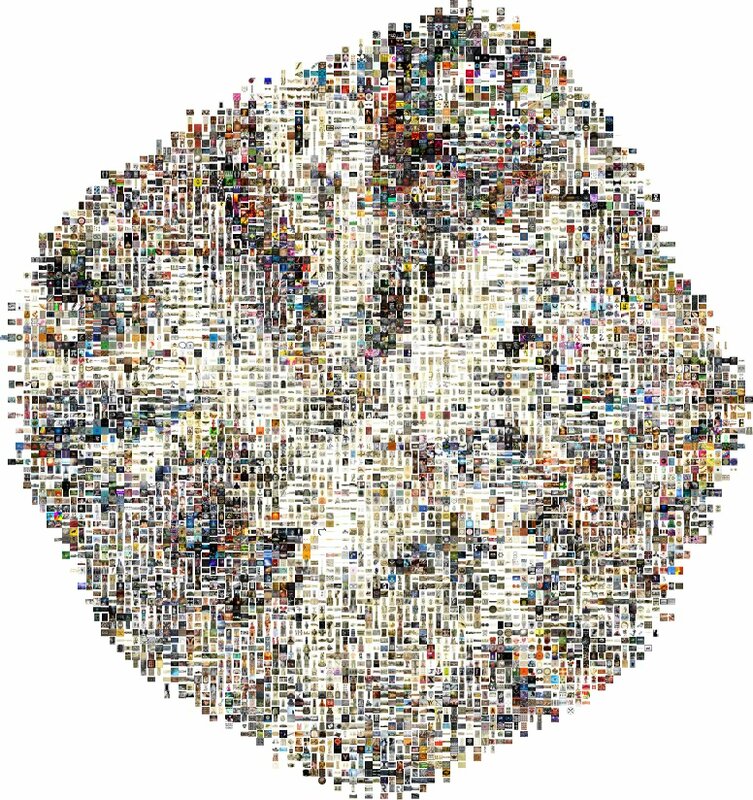 I would love to come up with a way to categorize similar images according to content, style, and facial information – and then generate a beautiful cluster or grid of images grouped by those categories. PROJECT IDEA #3: DISTORTED IMAGES. A variation on the first project idea, I’d like to explore the object recognition capabilities of popular computer vision libraries by taking a portrait of a person and slowly, frame by frame, incrementally distorting the image until it’s no longer recognized by the algorithm. The idea here is to test the limits of what computers can see and identify. 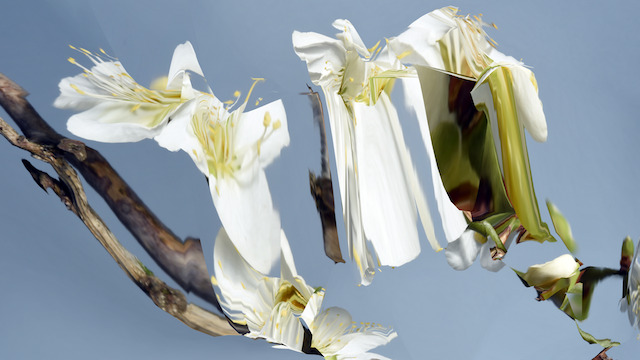 I’m taking my cues from the project Flower, in which the artist distorted stock images of flowers and ran them through Google’s Cloud Vision API to see how far they could morph a picture while still keeping it recognizable as a flower by computer vision algorithms. It’s essentially a way to determine the algorithm’s recognizable range of distortion (as well as human’s). 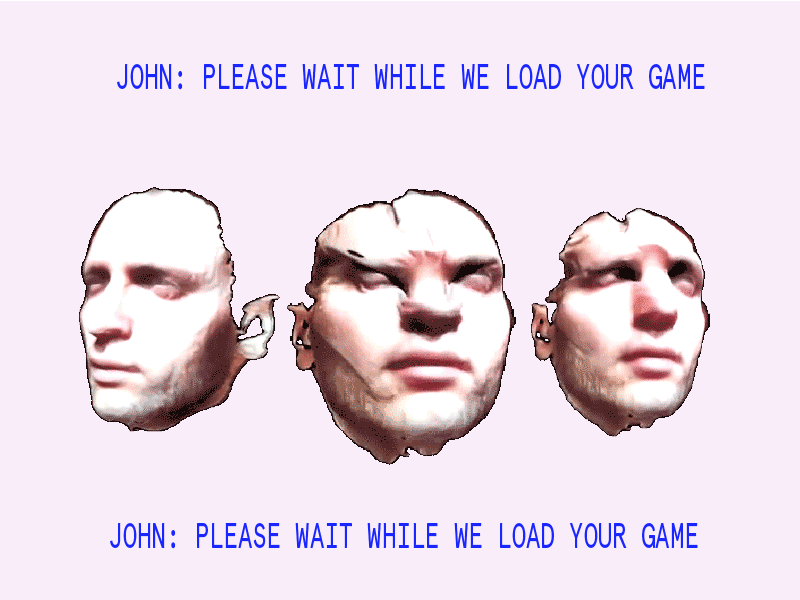 *After writing this post, I found an art installation Unseen Portraits that did what I’m describing – distorted images of faces in order to challenge face recognition algorithms. I definitely want to continue investigating this idea. PROJECT IDEA #4: interpreting BODY GESTURES IN paintings. Finally, I want to return to my idea I started with last week, which was focused on the interpretation of individual human body parts. When a computer looks at an ear, a knee, a toenail, what does it see? How does it describe bodies? 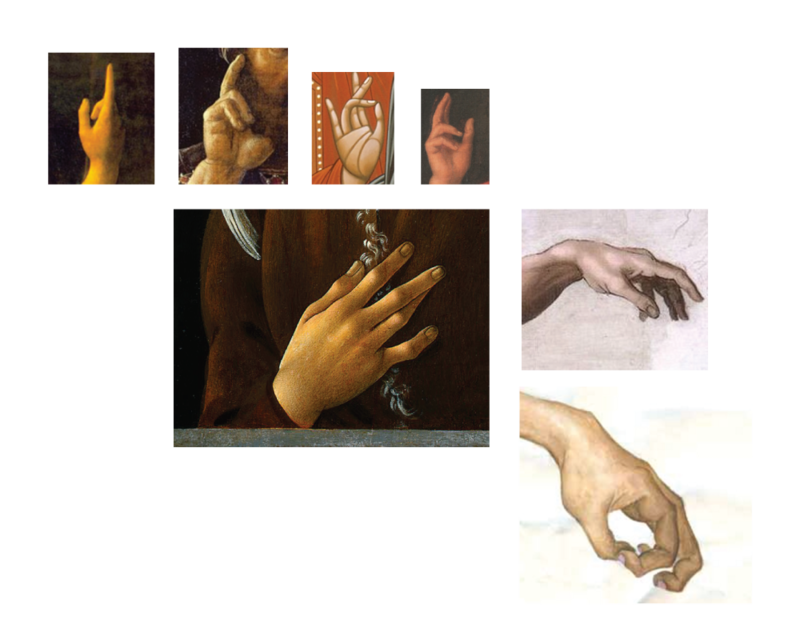 Last week, I started researching hand gestures in Italian Renaissance paintings because I was interested in knowing whether a computer vision algorithm trained on hand gestures would be able to interpret hand signals from art. 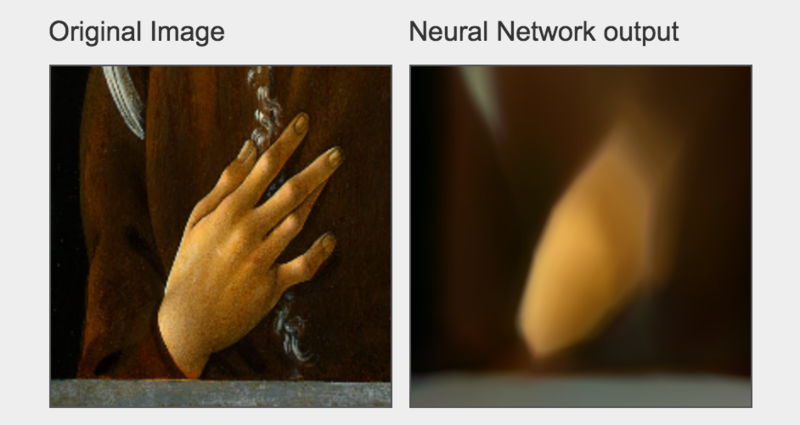 I thought that if traditional gestural machine learning tools proved unhelpful, it would be an amazing exercise to train a neural net on the hand signals found in religious paintings. 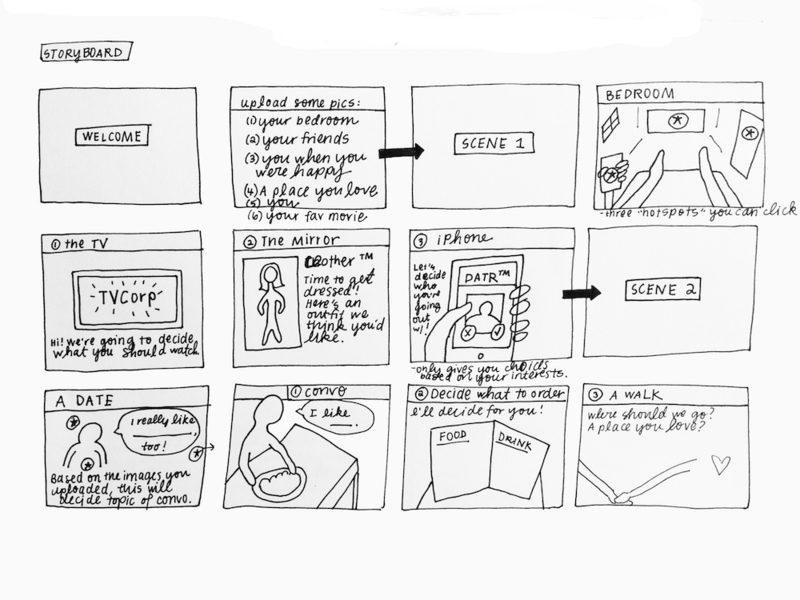 For this week’s assignment, we were to reframe or revisit our project idea through a scientific lens. 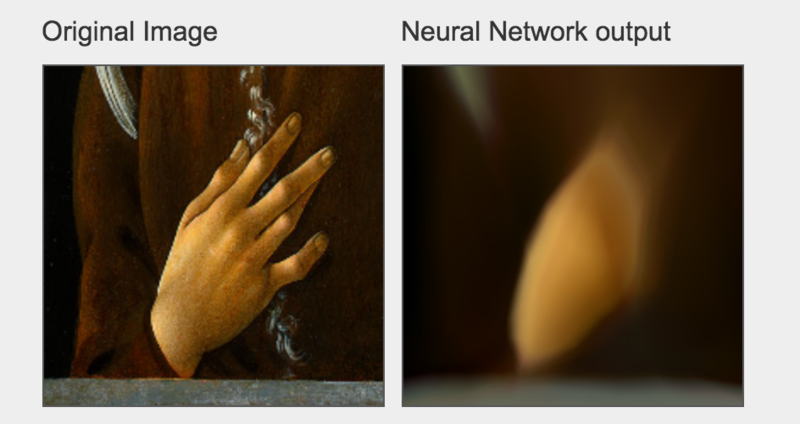 Since computer vision — characterized by image analysis, recognition, and interpretation — is itself considered a scientific discipline, I struggled to find a new scientific framework through which to re-articulate my project. 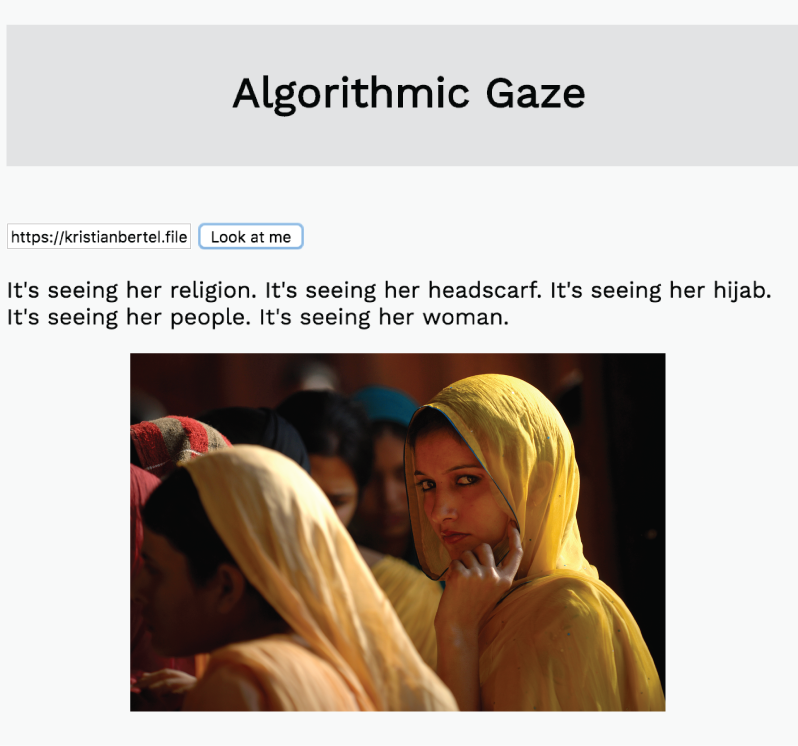 Because my project is so deeply rooted in computer vision and optics, I’m interested in exploring the idea of “algorithmic gaze” as the means by which computers categorize and label bodies according to specific (and flawed) modalities of power. Donna Haraway’s concept of the “scientific gaze” has very much influenced my research. In her paper “Situated Knowledges: The Science Question in Feminism and Privilege of Partial Perspective“, Haraway tears apart traditional ideas of scientific objectivity, including the idea of the subject as a passive, single point of empirical knowledge and the scientific gaze as objective observer. Instead, she advocates for situated knowledge, in which subjects are recognized as complex and the scientific gaze is dissolved into a network of imperfect/contested observations. 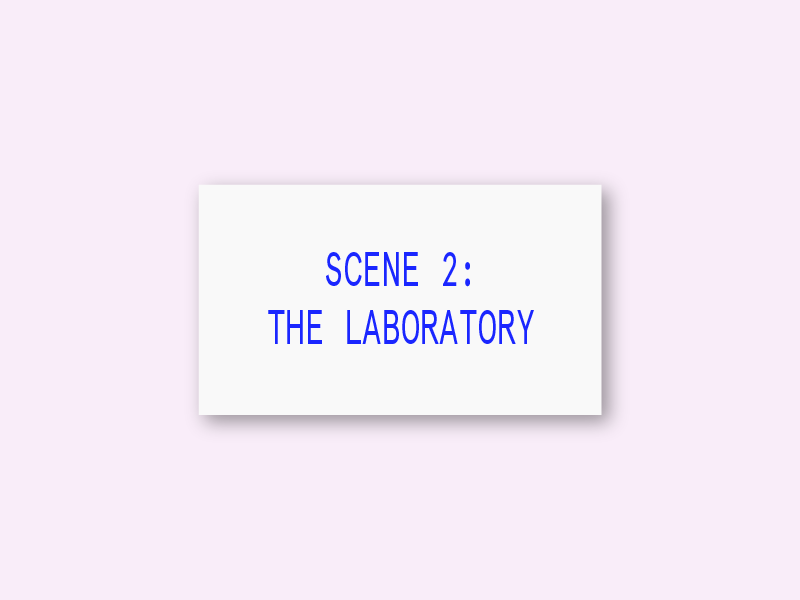 In this new framework, objects and observers are far from passive, exercising control over the scientific process. Haraway relies on the metaphor of vision, the all-seeing eye of Western science. She describes the scientific gaze as a kind of “god trick,” a move that positions science as the omniscient observer. The metaphor of optics, vision, and gaze will be central to the development of my project. 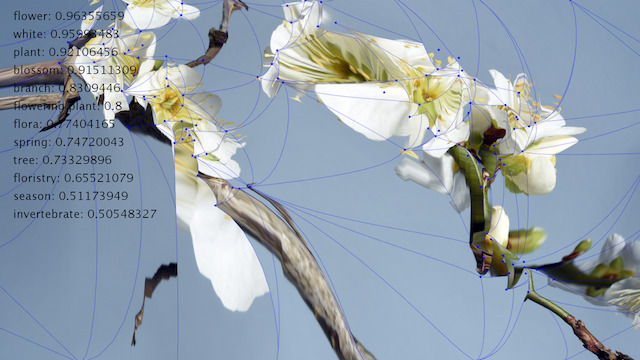 I’m interested in exploring how the “algorithmic gaze” mediates and shapes the information we receive. 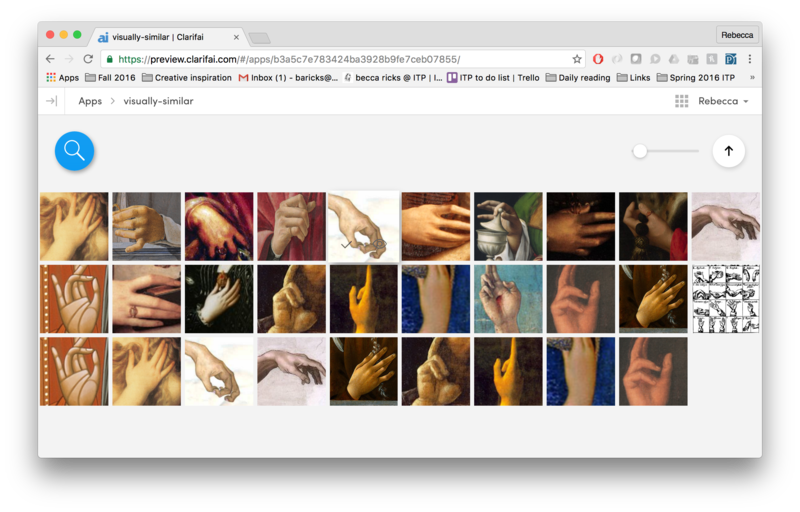 My first test was using ConvNetJS, a JS library built by Andrei Karpathy that uses neural networks to paint based on an image as input. 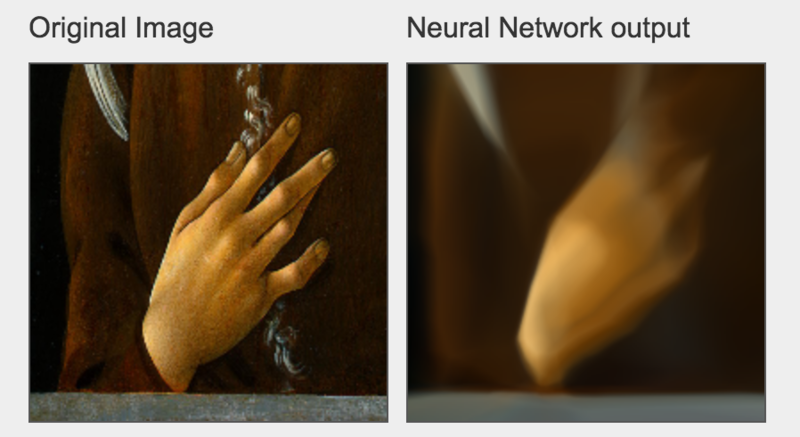 I used a detail from the painting above and ran it through the neural network. Here’s an example of the process.